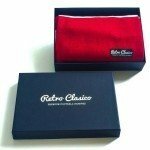 Retro Clasico – the football scarf reinvented. We have the single aim of making the finest traditional football scarves in the world. Having grown tired of the cheap, synthetic scarves served up in most club shops, we set about producing a premium football scarf, that was comfortable, stylish, and made to last. Designed In England. Woven In Nepal. All our luxury scarves are made of 100% premium merino wool. No cotton, no nylon, no filler. Just the good stuff! Bought as a gift for my son… Really impressed with the quality of the scarf. Hopefully he will be wearing it to Boro games for years to come!